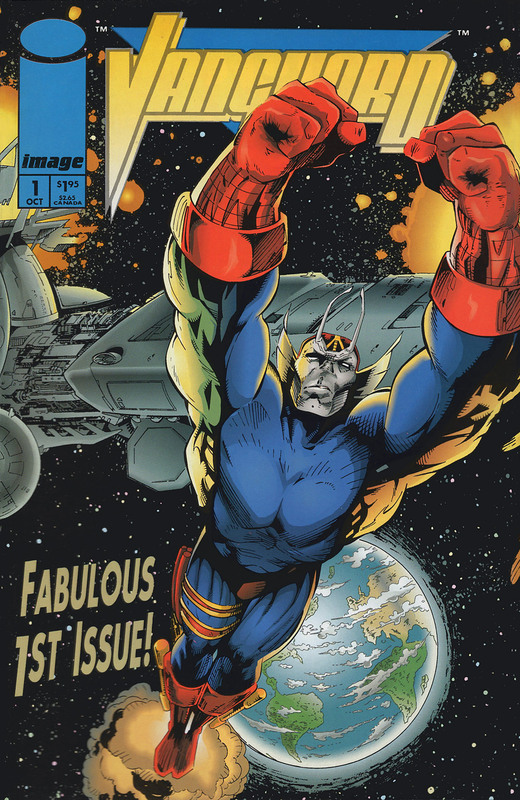 Vanguard is ordered to leave the orbit of Earth by the planet’s premiere protector Supreme. The veteran hero states that he knows of the Kalyptan race and that heir sacred mission to protect the universe, whether anyone else wants their help or not, will only to bring doom to his planet. The very threat that the young warrior is hoping to combat is likely to seek out Earth just to destroy him and all his people, bringing their insane war to an innocent world. The teenage hero refuses to leave his post and take his cloaked vessel with him, and is quickly defeated in battle by Supreme, whose strength dwarfs that of his own. The robotic Wally teleports the powerhouse into the vestiges of space before running a program on him, learning that the elderly man spent six months fighting alongside the Kalyptans around thirty years ago, but he soon had an argument with the war hero General Gronka and switched sides. Supreme flies back towards the large spacecraft and proceeds to tear it apart using his own power. After the vessel is crippled, he hurtles it out of the solar system where it will eventually crash into a meteor field. A weary Vanguard is forced to combat the man who had earlier thrashed him, but manages to use his battlesuit to absorb at least half of his foe’s strength. The alien proceeds to beat his opponent, with the United States government watching on in fear. Sentinel stands his people down as he wishes to witness the outcome of the fight before considering deploying his Youngblood team. NOTE: This story is reprinted from MEGATON #1. Aboard an orbiting alien vessel, the young warrior known as Vanguard grows weary of his assignment. He is to protect the Earth from his people’s enemies, though they have no knowledge of it’s existence, and no reason to attack the planet. A Russian android bursts through the vessel’s wall and attacks the hero. It’s superiors in the USSR have decided that the spacecraft must be part of the American’s growing weapon systems and they sent their defensive robotic agent to eliminate the threat before it can harm any of their people. The Cosmo VII manages to punch it’s opponent out of his home, sending him hurtling into the American capital of Washington, DC.